Modern climate science's fundamental premise (or assumption) is that the greenhouse gases (around 2% of the atmosphere) absorb radiant infrared (IR) heat (as derived by IR spectroscopy), and are a main climate driver because of this specialty. This premise has its origins with the John Tyndall 1859 thermopile infrared detection experiment. The (other) non-greenhouse gases (N2 nitrogen and O2 oxygen) are distinguished from the greenhouse gases by their (said*) inability to absorb (infrared) heat, as deduced from the same experiment: here absorption is confused with opacity. Raman spectroscopy (a complement to IR spectroscopy) challenges this greenhouse gas non greenhouse gas paradigm, and reveals this assumption and conclusion from any IR spectroscopy measurement to be false. It can be shown that N2 and O2 are, due to their symmetric vibration totally transparent to all IR detectors, but are not transparent to Raman detectors. Ramon Spectroscopy shows: CO2 and the other greenhouse gases to be typical, and not special; and that N2 and O2 to be greenhouse gases. Further claims are also challenged with respect to CO2 special properties in this entry. The only valid co-efficient or method to measure a gases heat absorption is by Specific Heat Capacity: where CO2 is a poor contender. In an earlier entry I cataloged where CO2's heat trapping property should but doesn’t repeat. Having found that CO2 doesn’t repeat (at least at any significant level so as to be measurable or notable) in this entry I am attempting to explain why CO2's heat trapping doesn’t repeat: why is it that we think it does. My conclusion is very disturbing: the foundation argument or premise of 'heat trapping, climate changing, CO2 does not appear to be consistent with the related fundamental laws and textbook knowledge of physics. I have found all of the foundation arguments can be (easily) challenged, just by studying these laws in detail. Inspired by the work of Galileo, I am tempted to call this entry ‘The Gassy Messenger’, but have opted for the said Dark Climate. Although Earth's atmosphere is 90% opaque to long wave IR radiation, the vast majority of the atmosphere is not composed of gases that cause the greenhouse effect. Molecular nitrogen (N2) and oxygen (O2) make up roughly 98% of our atmosphere, and neither is a greenhouse gas. So, although the greenhouse effect is very powerful, a very small fraction of Earth's atmospheric gases generate the effect. This greenhouse effect definition is developed and argued from the following experiments or theoretical claims (and others). One by one, in this entry I shall attempt to address all of them. 4. CO2 ‘s molecule structure: explanations suggesting it is the molecule structure (internal degrees of freedom) that determines the heat trapping ability of CO2. 5. The far infrared re emission (of heat energy). 6. Emphasis on Radiation, implied low emphasis of conduction and convection. From these experiments and demonstrations a climate axiom is formed, the greenhouse effect. However strong the findings of these experiments and demonstrations, they pose an atmospheric problem, paradox, even catastrophe. How can atmospheric convective phenomena - the likes of the sea breeze - be explained with the (heat trapping) greenhouse gas axiom? The greenhouse gases (water vapour, CO2, ozone, and methane) constitute only (around) 2% of the Earths atmosphere compared with the remaining 98% non greenhouse gases (molecular Nitrogen and Oxygen). This axiom begs the question: if oxygen and nitrogen are non-greenhouse gases because they have no IR heat ‘blocking’/ absorbing signature, then how is it that the atmosphere is warm at all? The sea-breeze used to be - and still is in any standard geography or aviation meteorology textbook - that when a ‘parcel’ of ‘air’ (which contains all the gases in the atmosphere) is heated by the land, it become less dense, rises, and this rising draws cold air in from the sea. How can this sea breeze be explained when around 98% of the gases of air are non-heat absorbent, and have no heat relationship? From other similar paradoxes in physics: the mysterious Dark Energy and Dark Matter, I chose to term this climate greenhouse paradox ‘the dark climate', and its 'dark gases’, and have set out to try and explain how this paradox is so. Where have the gases of our atmosphere gone?’ Why are they thermal neutral? Either the greenhouse gas axiom is right (and if this so, we must except this dark climate paradox), or the axiom are wrong and their founding experiments misinterpreted or misattributed. In this (following) entry I shall go through each experiment, one by one, and show that the assumption is wrong, and that each experiment is either wrong, misinterpreted or misattributed. I shall conclude that the (total) atmosphere is made up of only Greenhouse gases – i.e. that oxygen and nitrogen are also heat absorbent. I will show that CO2 is thermally typical, and not at all special - and restore the textbook sea breeze explanation (not that it had changed). It was the – little known –1859 Tyndall experiment that first identified and isolated what he interpreted to be, and what we now know as the greenhouse gases. Below is a summary of his experiment, note that oxygen and nitrogen were found not to (what he thought at the time to) ‘absorb’ infrared. 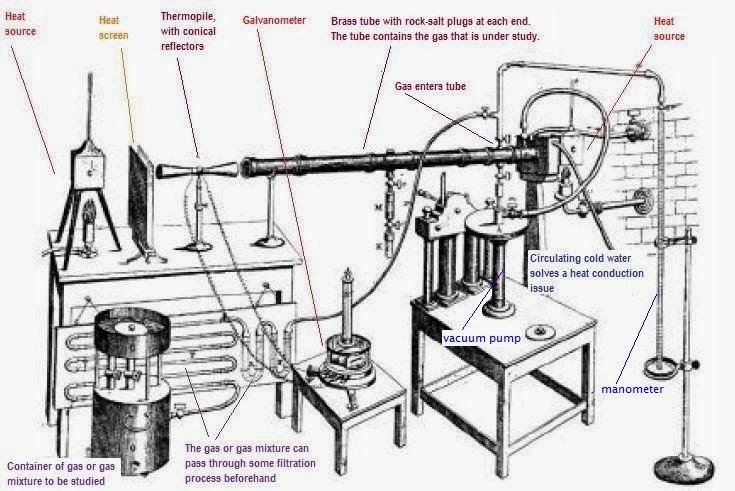 To this day it is inferred by this experiment that greenhouse gases are by nature, infrared absorbing. Tyndall explained the heat in the Earth's atmosphere in terms of the capacities of the various gases in the air to absorb radiant heat, also known as infrared radiation. His measuring device, which used thermopile technology, is an early landmark in the history of absorption spectroscopy of gases. 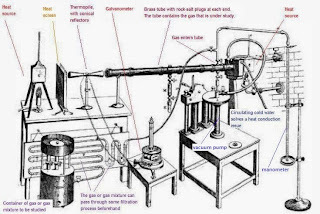 He was the first to correctly measure the relative infrared absorptive powers of the gases nitrogen, oxygen, water vapour, carbon dioxide, ozone, methane, etc. (year 1859). He concluded that water vapour is the strongest absorber of radiant heat in the atmosphere and is the principal gas controlling air temperature. Absorption by the other gases is not negligible but relatively small. Prior to Tyndall it was widely surmised that the Earth's atmosphere has a Greenhouse Effect, but he was the first to prove it. The proof was that water vapor strongly absorbed infrared radiation. Relatedly, Tyndall in 1860 was first to demonstrate and quantify that visually transparent gases are infrared emitters. In the following clip Dr. Ian Stewart demonstrates the basic Tyndall experiment. Tyndall’s experiment can easily be repeated and his findings reasoned in a modern context – just as we can Galileo’s 1609-1610 telescopic observations of the Moon, Jupiter, and Venus. The apparatus used is the readily, and relatively cheaply available in the from of the non-contact infrared thermometer or by its more advanced relative, as shown in the clip above, the thermal imaging camera. Though these modern day ‘gadgets’ are more advanced and more adjustable than that available in Tyndall’s time, they operate using the same sensor technology, the thermopile. The following gives some detail to the thermopile and makes the link to today’s common IR detectors. A thermopile is an electronic device that converts thermal energy into electrical energy. It is composed of severalthermocouples connected usually in series or, less commonly, in parallel. Thermopiles do not respond to absolute temperature, but generate an output voltage proportional to a local temperature difference or temperature gradient. Thermopiles are used to provide an output in response to temperature as part of a temperature measuring device, such as the infrared thermometers widely used by medical professionals to measure body temperature. They are also used widely in heat flux sensors (such as the Moll thermopile and Eppley pyrheliometer) and gas burner safety controls. The output of a thermopile is usually in the range of tens or hundreds of millivolts. As well as increasing the signal level, the device may be used to provide spatial temperature averaging. Infrared Thermal Imaging Cameras or Infrared Cameras are essentially infrared radiation thermometers that measure the temperature at many points over a relatively large area to generate a two-dimensional image, called a thermogram, with each pixel representing a temperature. Today could be said to be the age of infrared: we use it in many applications including meteorology and astronomy; it allows us to ‘see’ where we are otherwise blind. But to use it, the operator should have an understanding of the underlying (laws of) physics the IR instrument responds to. They must understand its limitations; just as a pilot understands the limitations of an altimeter or compass and how they too can give misleading information. To cover this new knowledge these limitations, all IR measuring instruments come with an operating manual, that are readily available to read on the Internet. There are also training videos such as the one below on IR camera's and transparency. What these publications spell out (among other things such a opacity and transparency) is that the instrument measures infrared radiation and not temperature, and that they only read what the instrument can ‘see’ (at the set frequency). This is to say: if at the set frequency of the instrument something is opaque to IR, it can see it, and it can therefore measure it; and if something is transparent, it cannot see it, and therefore cannot measure it. As with the above clip, one operating manual that clearly spells this out (and more) is the ‘infrared basics’ manual found on the internet – from which I shall paste the most relevant. Thin film plastics are the classic example of selective emitters. These materials are made up of long chains of hydrogen and carbon atoms. The repetitive and uniform molecular structure of these materials means that the molecules and atoms all vibrate with a uniform series of harmonic frequencies. Infrared wavelengths coincident with these harmonic frequencies are preferentially absorbed (not reflected or transmitted) by the plastic material, and conversely, these materials emit infrared energy preferentially at the wavelengths coincident with these harmonic frequencies. When we look at a plastic sandwich bag we can see right through it, but if our eyes were filtered at 3.43 microns, which is the harmonic frequency for the H-C atomic bond, then the sandwich bag would appear completely opaque. When measuring the temperature of a selective emitter it is critical that a wavelength be selected to coincide with a strong emission band. This is a wavelength where the infrared emissions approach blackbody conditions, and where the material is highly opaque and non-reflective. Other examples of selective emitters are all gasses, and all highly transparent materials. Many crystalline materials, such as silicon and engineered ceramics, are also selective emitters. The uniformity and geometry of the molecular structure dictates the emissive nature of the material. Thin film coatings also act like selective emitters. In the metals industry, metal strips are often coated with a thin film. Oil-based paint, water-based paint, oil and wax are all examples of thin film coatings that can act like selective emitters. These materials are highly transparent at some wavelengths, and they are highly opaque and non-reflective at other wavelengths. The emissivity of the coated material is therefore highly influenced by the wavelength of measurement. The optimum wavelength of operation for an infrared thermometer will vary depending upon the coating material, the thickness, the required temperature range, and the need to view the coating or to view through the coating. Without this theory, measurement would seem like a kind of magic, especially when measuring the temperature of a warm object through glass as opposed with through thin air. One only has to look at police night vision images of culprits hiding under plastic covers thing they are safe and hid - not so in the infrared. In light of this theory, and application of modern day instruments, the early Tyndall conclusions seem to be outdated: his conclusions need updating. This clip, and the original 1859 Tyndall Experiment, is not a demonstration of heat absorption, but rather a demonstration of the physical transition properties of (infrared) light and its affect on different substances. What we see is the image of a flicking candle in the IR camera, and as the CO2 is let into the (sealed) cylinder the bright candle image turns to a blue colour. It is concluded, just as Tyndall did that the CO2 absorbs the infrared or is accentually trapping the heat from the candle. From the above literature and application of the instrument and alternative conclusion should/could read: The bright candle image turns to a blue colour as the CO2 is opaque to the infrared the frequency the camera is measuring at and that the gases before the CO2 is let in are transparent at that frequency. To test this reasoning we could have equally placed glass in front of the candle and got the same of similar result as the CO2 It should be noted that Tyndall used rock salt crystal to contain the gases – rock salt crystal is transparent at that frequency. In the Stewart demonstration rock salt is not used, but (IR transparent) thin plastic ‘clean full’ is. This can clearly be seen at time.. That the image colour turned blue shows the detector measuring the IR radiation emitted from the CO2 and thus its temperature. We could deduce from the colour that the CO2 that it is cold (which it should be coming from a pressurized state) or at least the temperature of the ambient gases it displaced. If this interpretation is wrong, then we could equally conclude that window glass is a equally ‘greenhouse’ solid just as CO2 is a greenhouse gas. We don’t, it isn't. 2. N2 and O2 have no dipole, so they are not greenhouse gases. Yes N2 and O2 are both transparent to IR spectroscopy, but this fact it begs the question (as stated above): how can the atmosphere be warm if 98% of it (N2 and O2) are not IR (heat) ‘absorbent'? How can N2 and O2 be non greenhouse gas, yet they have a heat capacity coefficient? Something must be wrong with this conjecture. To solve this paradox an alternative measuring instrument or method other than IR spectroscopy must be sourced to reveal the true IR properties of N2 and O2 (and all other gases). Such an instrument does exist, Raman spectroscopy. Raman spectroscopy is well explained in the following clips. I suggest you play them more than once to yourself as they are very insightful and offer perfect solution to the dark climate paradox. A hypothesis was set: N2 and O2 have an infrared signature. To confirm this hypothesis either an experiment with a sample of the atmosphere would be conducted measuring for N2 and O2 in the IR region of the EM spectrum, or secondary research would point to a similar result. In the absence of an experiment, secondary results were searched using a google image search with the key words Raman spectcoscopy atmosphere. A positive image ('Fig. 11' below) was quickly found. This figure and its caption clearly comes from an unrelated journal publication, but the image reveals what many others in the same search reveal - such as: Heat Treating: Proceedings of the 16th Conference.Jon L. Dossett, Robert E. Luetje, 1996 page 228.
Notable are the O2 and N2 peaks at wavenumber 1556cm-1 and 2331cm-1 respectively. These wavenumbers correspond to wavelengths 6.43 microns and 4.29 microns respectively - in the near infrared region of the EM. Another image found is the below (Fig. 18) showing again the 1556 O2, and other peaks at higher wavelengths along the spectrum. From these images it can be concluded that N2, and O2 (and other gases) are infrared opaque or absorbent, and are too greenhouse gases. why not? Are the stretching modes of O2 and N2 Raman active? Why or why not? molecule; hence, the stretching mode is not IR active. centers of symmetry, the stretching mode must be Raman active because it is IR inactive. It should be noted that the very fact that Nitrogen (N2) is symmetrical AND made of identical atoms is the reason it is transparent to IR spectroscopy: it is symmetrical by nature, and so will never show up, as a law of physics, even in part, like other molecules such as CO2 . I can only conclude that N2 and O2 are not at all IR transparent, it is an instrumentation and knowledge problem. If this Raman spectroscopy discovery is found true, then the 2% (volume) of said greenhouse gases should be revised and relegated to 100%, by adding N2 and O2 (and others if so). Any assumptions or premises made by any climate models, climate knowledge, or claims that the atmosphere consists of around 2 % (volume) special greenhouse gases will need reviewed – as said above. In brief: these experiments demonstrate CO2 's relatively low heat capacity. These experiments should be conducted with a hypothesis testing the heat capacity of CO2 compared to air and rising temperatures. In brief, there is relatively low (heat) energy the far infrared. I think you make some errors in this post. There are two fundamental premises about CO2. Firstly, that it traps heat in the atmosphere. Heat by definition cannot be trapped. But more importantly, the trapped heat turns out not to be trapped because it is said to return to the surface and cause additional heating. The two premises are essential for the theory of human caused global warming. It is of course impossible firstly, for heat to be trapped anywhere (except perhaps as latent heat but this is not relevant with CO2) and secondly, for heat to be transferred from the colder atmosphere to the warmer surface. I think you made a mistake with the quote of the greenhouse effect. A better quote is just before this paragraph in the reference and it is: "The greenhouse gases act as a blanket covering Earth's surface; a lot of energy flows back and forth between the insulating blanket and the "body" of the planet beneath; but relatively little escapes from this efficient insulating cover." It is just utter nonsense. Heat does not flow back and forth. Heat always travels from a high temperature to a lower temperature. In any case insulation does not increase the temperature of anything. It cannot because it does not spontaneously generate thermal energy or do work. All insulation does is to reduce the energy needed to maintain a specific temperature. The article you refer goes on to discuss what I refer to as back-radiation. This is the idea that radiation leaves the surface, is trapped by CO2 and then returns to the surface causing additional heating. This is not possible. Although radiation will be exchanged, radiation is not the same as thermal energy transfer and there is no mechanism by which an object can heat itself by returning radiation. The quote exposes a fundamental issue. If, as they say, very little heat escapes, then how can they claim that there is an energy balance at the surface of the atmosphere. I believe you miss an essential point in this article and that is the so called energy balance diagram is no such thing. Look at the quantities. They are not energy but energy flux (w/m2). Flux is not a conserved quantity. The area associated with the flux from the sun is half the earth's surface. The surface associated with the energy leaving is the entire surface. By equating the fluxes the energy leaving is doubled and hence the need for the nonsense theory of back radiation. They also assume a balance at the surface for which there is no justification and this produces more heat from nowhere. You also miss another point when discussing the 2% of greenhouse gases. It is only the human increases of CO2 that are said to cause the warming. This has been about 100ppm. Effectively 1 extra molecule of CO2 out of every 10,000 is causing the warming of the surface. Your rational discussion is pointless when the entire issue of AGW is completely wrong and irrational. AGW is not about science, it is about money. People benefit from taxation to develop renewable energy and scientists who will only get government funding if they waste their time on pointless research based on nonsense. I note that you have challenged Brian Cox on an issue. I suggest you look for the YouTube video of his appearance on the Australian TV programme "Q&A" in 2016 where he discussed climate change with Malcolm Roberts. Cox's evidence was that there is a consensus of scientists who are in agreement. I wonder if he would claim a consensus of scientists agree that the Higgs Boson particle exists. Of course not, it was based on experimental evidence. He also held up graphs of CO2 and temperature claiming that the apparent correlation was evidence of causation. He has been bought by money. Thank you for the feedback. I have now published my updated theory of the atmosphere. Your Post is very useful, I am truly happy to post my note on this blog about Air Conditioning Unit Installation this topic. It helped me with ocean of awareness so I really consider you will do much better in the future.